I thought signs like this would be superfluous with the fancy new street layout, which we were told would intrinsically suggest to drivers that they are moving through a pedestrian priority area. But evidently this isn’t the case. I also thought shared space advocates had a hostile dislike of ‘street clutter’ like this, which presciptively – and unnecessarily – informs road users of the correct way to behave. It seems that giving way is evidently something that is not coming naturally to motorists – perhaps it’s not that easy to get rid of signs. Anyway, let’s see how ‘giving way to pedestrians’ works in practice. If I had continued attempting to cross here, I would have ended up on the bonnet of this Peugeot. Rather than ‘giving way’ to me, the Mercedes moves over to the right, preventing me from crossing. I’m then in the path of a taxi who makes no attempt to yield. I hastily have to retreat backwards – hence the shaky camerawork. Having finally crossed the road when there weren’t any motor vehicles about – how I would have crossed the road anyway, in the absence of ‘sharing’ – I then crossed back. Again, we see drivers failing to give way, in this instance, two taxis. It is interesting to note that the second ‘Union Jack’ taxi driver, like the Mercedes in the previous example, is able to use the increased width of the road to ‘outflank’ me, and prevent me from crossing. The third taxi – who flashes his lights – lets me go, but only, I suspect, because he was already slowing for a queue of vehicles at the lights ahead of him. Again, this would be perfectly ordinary behaviour in the absence of ‘shared space’. I’m not really sensing a revolution in driver behaviour here. I’m back in the area again tomorrow to see if things have improved. Wish me luck. 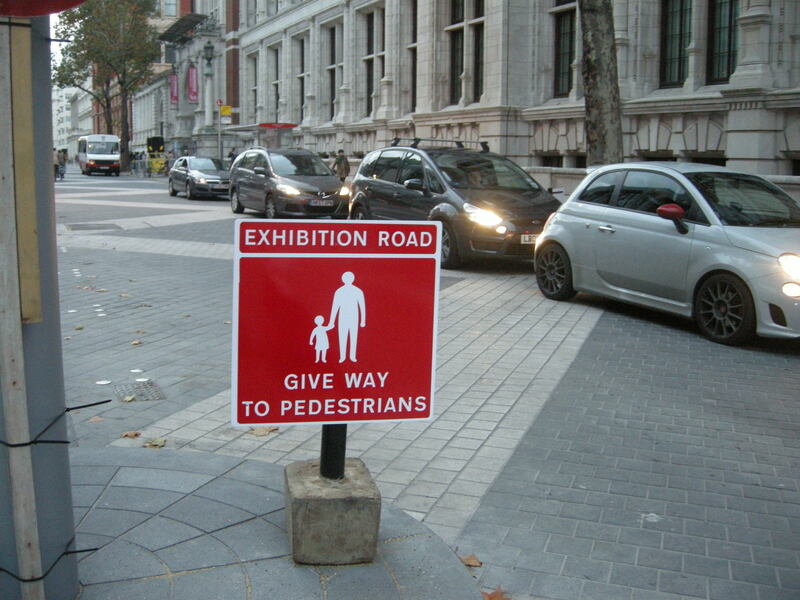 This entry was posted in Infrastructure, London, Shared Space, Transport for London. Bookmark the permalink. nice article – thanks. i wd be immensely surprised if anyone paid any attention to those signs. with no legal backing, they’re worthless. perhaps we need some police stopping people and educating them on why it’s important to read and obey road signs – but can’t imagine that happening. along tooley street, westbound, near London Bridge, there are lots of signs saying “narrow road – do not overtake cyclists”. i doubt anyone pays any attention to those – if they wanna get past, they will! Bullies bully, that’s what they do. Why am I not surprised? The fact is that the road layout is incompetent. Why didn’t anyone think of a trial scheme. The road engineers must now realise the stupidity of what they’ve done. I seem to recall that the Exhibition Road scheme was intended to follow a concept of “Naked Streets” developed by a Dutch architectm and which is widely adopted, with success, in the Netherlands. I have also seen it adopted fairly successfully in some villages and suburbs in France. I have experienced Exhibition Road for myself with similarly disappointing results, and I wonder whether its failure relates to its very specific location in central London, or to something wider, showing perhaps that not all Dutch road design concepts can be successfully imported to the UK – wihch would be a shame. I think the issue is the amount of traffic. This sort of shared/flexible surface seems to work well where there is very little traffic and it’s clear that vehicles are guests — on residential streets and on bigger streets which have been made non-through routes so that they’re only useful for access/delivery. They put some in outside Herne Hill station a couple of years ago and it seems to work because it’s deliveries only. Seems to have enlivened that street, with the greengrocer and cafe spilling out onto the street. Last time I was in Glasgow their new shared space area was working very nicely — but that’s perhaps because construction work made the street a non-through route. The problem with Exhibition Road, and with Seven Dials, and with Blackpool Promenade, and with Haren in the Netherlands, is that they are being used as main through routes and so are stuffed with traffic who will never feel like “guests”. Joe has it exactly right. These spaces work very well on cul de sacs, closed off streets and very quiet roads with no real through traffic. Turning one of London’s main traffic arteries in to a play scheme was never going to work unless the volume of motorised traffic passing through was reduced. Exhibition Road is home to housing, two large churches, a mosque, a school, a massive University, university residential blocks and three world class museums. It should just be pedestrianised, full stop. Incidentally, in the pursuit of the “naked streets” aesthetic, there is now nowhere to lock your bloody bike either! The shared space concept in the Netherlands was developed by Hans Monderman and has been widely publicised in the UK by Hamilton Bailie. 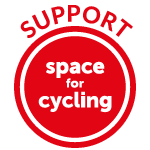 However, it is not widely used in the Netherlands, only in a few locations, and there is a great deal of dissent there, particularly from cycling groups, about its worth. It runs contrary to the normal Dutch trend of segregation of transport modes, few seem to be advocating for it since the death of Monderman, and AFAIK pilots are not being extended. Much more on the subject here and here. This is pretty much a first for London. It would be foolish to expect a change in behaviour immediately, hence the temporary signs reminding drivers of pedestrian priority. Similar schemes in Europe have MASSIVELY reduced pedestrian and cyclists injuries. Can’t we give it a bit more than a week to declare it a huge failure? If you actually thought that the introduction of a shared space road would immediately result in a radical transformation of driver’s behaviour, I think you had set your sights a bit too high. You’re right, it is too early to dismiss this scheme out of hand, and I haven’t done so. You make the argument that drivers haven’t yet had a chance to get used to this scheme, and that might account for the failure to ‘share’ that I experienced. Maybe this is true. But there is, of course, a counter-argument – the fact that drivers are not used to it should mean that their driving should be more careful and considerate, not less. Indeed, it is the very uncertainty of these kinds of street environments – the ‘good chaos’ their designers talk about – that is supposed to yield the good behaviour. So I could suggest that as drivers become more used to the way this street is laid out – and their ‘uncertainty’ correspondingly decreases – so they will be less inclined to share. We have a very modest naked streets design in my town (Andover). It’s basically a T junction near the town centre with the busier road as the top of the T. It’s in a 20 MPH zone, but nobody takes much notice of that. Initially, the lowered kerbs and lack of right-of-way signage caused confusion amongst motorists, and they slowed down, and negotiating with them (as a cyclist) as to who was going first kind of worked. Now they have got used to the idea that it’s a free for all, and realise if they just blast along they can usually intimidate anyone on the minor leg of the junction into stopping, and they still expect pedestrians to jump. Thus in their eyes, I suspect, the ‘proper’ right of way has been re-established. My point here is that sadly, I’m not convinced that the great British Motorist is going to let a few naked street designs get in their way. Worst culprits by the way are bus, cab and white van drivers, although the average car driver isn’t far behind. That said, there aren’t any pedestrian priority signs, I only know of the naked streets concept because it interests me. I don’t think the average local either knows or cares. It needs a huge culture change, road design alone is not enough. Just as with bad cycle facilities we shouldn’t use poor examples to dismiss the concept. Of course you need a healthy balance of users for shared space to work and I suspect it is a very difficult thing to engineer particularly in a street that’s clearly a taxi route. Come to Walthamstow High Street to see a shared space that seems to have developed somehwat naturally without intent. The Dutch prinicple is quite clearly ‘mix where possible, segregate where necessary’. Sounds sensible to me, but leaves a lot open to interpretation. Really? Is that quite clear? I’m not sure I even know what “where possible” would mean, let alone that it is “quite clear”. In fact, the Dutch principles do make things clear by having a very clear mapping between type of road and type of provision. When deciding on the right provision they don’t start by asking “is it possible to mix here?” (as the failed British “hierarchy of provision” does), they start by asking: is it a residential street? a country lane? a main road? If it’s a main road they separate with cycle tracks — they don’t first give mixing a try to see if it’s “possible”. If it’s not a main road they don’t separate with cycle tracks (though they do plenty of other things instead). There is very little “open to interpretation” — certainly not the headline decision of separation or no separation. Leaving everything open to interpretation is why the British hierarchy of provision can be and frequently is “interpreted” to support all the crap and non-existent cycle provision in this country. In terms of shared space on busy through main roads, I would be surprised if there are not already more examples of it in the UK than there are in NL. Those Dutch examples are themselves experimental, and all the evidence I’ve seen says there’s little appetite for more of it. Err, is it? My experience of cycling in the Netherlands involved very little ‘mixing’ with motor vehicles at all. This doesn’t suggest that ‘mixing’ is employed ‘where possible’ – quite the opposite. The Dutch most certainly do advocate ‘mix when possible, separate when necessary’, as Gerhard says, but Joe is also correct that this mantra is applied to a well-defined hierarchy of street types as defined by their ‘sustainable safety’ model of urban design. What this means in practice is that low-motor traffic, low-speed (largely residential) zones are usually mixed, whereas mains roads separate pedestrians, cycles and motor traffic. If Exhibition Road were just a destination, shared space would work. It fails because it’s a through route. Inappropriate implementation of potentially good ideas fail. I was there a couple of weeks ago. As I waited outside the V&A side entrance, I noticed a guy on the opposite side in a wheelchair. He was looking for a chance to cross, and quite agitatedly moved up and down the pavement looking for, I assume, some sign as to how he might get across. Before I could cross and ask if I could help, he’d given up and was heading towards Cromwell Road. God help him crossing that. Utterly deplorable that in the host city for the 2012 Paralympics, there’s an apartheid going on right under our nose. Most of us are coming at this from the cycling end of the spectrum, but I’m embarrassed by the lack of provision for pedestrians and disabled people. I’ve walked around central London in the past with a blind friend – I imagine the lack of kerbs or real crossings would be even worse than what he’s used to, and, trust me, that ain’t much. Another angle that this scheme ignores : I recently completed my MSc dissertation which looked at quantifying the potential for green infrastructure, particularly Rain Gardens and vegetated urban drainage systems. These are being used in forward-thinking cities – eg. Copenhagen, Berlin, Portland, Chicago… (all, coincidentally (or not!) cities with big cycling infrastructure initiatives) to capture flash-flooding and reduce the need for infrastructure such as our proposed multi-billion pound “Super Sewer.” A side-effect of increased vegetation is a major reduction in NOx, PM10’s etc. from vehicle emissions, and also reductions (by evapo-transpirative cooling) in Urban Heat Island Effect. Many benefits (and cost savings) from a joined-up approach to urban realm design. The Exhibition Road site, with the Natural History Museum, the Science Museum, Imperial College, Royal Geographical Society et al. as neighbours, would have been the ideal site for a cutting-edge green infrastructure approach to all the above problems. The area to the south of Cromwell road, around South Ken tube, could have been a tree-lined urban oasis of pavement cafés and sound-attenuating vegetation. Instead, we get a lot of expensive granite which is already looking beaten up and dirty. I work on Exhibition Road and as far as I can see nothing much has really changed; they might have started out with good intentions but compromise and vested interests have turned it into just a resurfaced road with pretty lampposts. In theory it is a 20mph road; unenforced and, to all intent and purposes, unenforceable, which doesn’t give pedestrians much confidence in ‘sharing’ to start with. It is also absolutely crammed with parked cars, in fact they boast that there are more parking spaces than before and this show the weight of the most powerful vested interest at work, local residents. This area is the richest residential area, certainly in the UK, possibly in Europe and to think that you could do anything to even slightly inconvenience them was naive. There are several very distinctive vehicles here and none of them are more than 20′ from where they used to be parked,meaning that the pedestrian area is at its narrowest right outside the Science Museum exit, the busiest part of the whole road. There is also a suggestion, possibly rumour, that residents vetoed seating in case ‘tramps’ slept on them and then thought it all looked very scruffy when people sat in doorways, hence the expensive retrofitting of seats involving diamond drilling though 8” of solid granite. It is such a shame because it could – and should – have been a wonderful space, and it isn’t. Once again car centric planning and political dogma have turned an idea that works well in other countries, even other cities, into an expensive waste of time that can be held up by the car lobby as to why you never try to change anything. Joe says that “Similar schemes in Europe have MASSIVELY reduced pedestrian and cyclists injuries”. Is there any evidence for this? I haven’t seen any. Yes, I have seen successful examples of shared space on the continent, but they occur in town and city centre locations where invariably a huge amount of work has been put into the surrounding street network in terms of traffic elimination and prioritising of walking, cycling and public transport, to ensure that few cars go into the shared space. Getting hold of this shared space idea and just plonking it down arbitrarily in one big London street with through traffic ain’t going to work IMO. It is argued we should wait a while before coming to any conclusions about whether it is working. Are we going to have to wait until a few vulnerable people get hurt? This could easily be made to work much better. Allow traffic only to exit onto Cromwell Road and Kensington Gore, not to enter Exhibition Rd from these streets… so entry has to come from Prince Consort Rd or other sidestreets. This eliminates the through-traffic. I think the difficulty in translating the Monderman approach to the United Kingdom is shown here: that is, the ‘target street’ or ‘target environment’ has to be the right one. Shared space / shared surfaces work well in other locations over here because of light trafficking: Exhibition Road has always been a heavily used North-South route, and the designers hoped a new ban turn would divert a lot of traffic away from it and onto the parallel Queen’s Gate. I’m not sure if all the banned movements have been implemented yet: I await with interest what happens on ExRd over the next few months as the scheme beds in. It would be a shame if a noble aim is forever tarnished by one infamous and inappropriate use where others have succeeded but away from the spot light. Hmm. I’m not quite sure if I get this “noble aim” business. There is a flavour in some of these replies of “Oh we really wish it could have worked”. I have written on this before, where I called it “shared space romanticism”. I don’t quite understand this emotional pull towards the shared space concept that makes people want, oh so badly, for it to work, so they choose quite inappropriate places to apply it, and then claim “It wasn’t done properly”. It seems to have a slightly ideological flavour to it. I don’t get the idea of why shared space is held to be superior to separation of modes. As what Joe Dunkley was saying implies, you do need route networks in cities for motor vehicles and bikes. Shared space is incompatible with these: being virtually pedestrianisation, but slightly less prescriptive, it can only happen in places where you do not want the vehicular routes. Those who come at this from cycling perspective need to realise that true shared space is as incompatible with bicycle through-routes as it is with motor ones. Since we do not have a satisfactory network of cycle routes in London, from a pure cycling perspective, shared space is not a thing to be campaigning for. It’s not a cycling solution except maybe for final destinations. Importantly, the putting-in of shared space, even if it does work, is likely to move the achievement of an effective cycle network further away than ever, and that, broadly, is bad for the city. Shared space can be a good thing here and there, but I don’t think it can be a very major component of liveable cities. If you look at Dutch cities, and some German ones, e.g. Münster, which I think are highly liveable places, you see that shared space is very exceptional there. It is an “icing on a cake” that is basically achieved through separation of modes and prioritisation of the desirable ones. Therein lies the basic flaw of shared space: it can’t prioritise anything. As at Exhibition Road, if things are just allowed to run their course, in shared space on routes, the priority of motor vehicles will re-establish itself. I use this road as part of my daily commute from work and I totally agree that this new concept has insufficient results in terms of pedestrian and cycle friendliness. I also believe the same amount of money could have been spent in a better way if you want to reduce traffic and encourage cycling and walking. On the positive side my subjective feeling is that the number of cars driving on Exhibition road has been somewhat reduced. However you don’t need to spend almost £30 million to achieve that. – People on bikes are still seen as obstructive objects drivers have to overtake aggressively. So much for the “shared space” concept. it looks like a massive improvement – and that there seem to be some determined to ally themselves with the likes of Jeremy Clarkson and knock the concept. Do they really think that the 4 lane dual carriageway with pedestrians confined to narrow pavements and all that cycle crushing guard railing was better? Posting a video of some idiot trying to time their crossing to intercept a taxi and force an emergency stop really isn’t that persuasive – the very fact that someone feels they can wander about in the street making a video in the first place suggests a measure of success – I doubt they would have attempted that under the original layout. The argument seems that anything less than the most extreme example of shared space with hardly any traffic and pedestrians free to wander without a care in the world represents a complete failure. This is a straw man – shared space philosophy covers a very broad range from virtual pedestrianisation to fairly minimal concessions to the concept – such as on Kensington High Street. The judgement shouldn’t be is this scheme as virtually as good for pedestrians as banning cars altogether – but is it better than what went before. Now drivers probably do break the 20mph limit, but they will have been breaking the 30mph one before. I would be astonished if the speeds hadn’t reduced as a result of the changes – certainly the posted videos look pretty tame to me. Yes, drivers are not treating the road as a mile long pedestrian crossing, but that does not mean it is not much easier to cross than it was before. There is still a logic to shared space streets with pedestrians tending to colonise the sides and drivers tending to make a path through the centre. The aim is not to achieve complete chaos just to blur the distinction so that everyone has to take more care. Yes drivers will still overtake cyclists – I cant see the problem with that as there is plenty of space – whereas the previous arrangement with narrow lanes next to parked cars looks like you would get lots of close overtakes if you didn’t ride assertively. Contrary to what you write, the former layout was *not* a dual carriageway, and nor was there any guard rail along it; the exception was a short stretch at the junction with Cromwell Road. I’m not sure where you got this impression from. The point of the videos is to show that trying to cross the road here under this new layout is barely any different from trying to cross it under the old layout. I wasn’t trying to force a taxi to make an emergency stop (it wouldn’t have needed to, in any case – merely slowed a little to let me across, as the signs on the road instruct drivers) – I was simply trying to establish whether vehicles would behave any differently on the new layout than they would have done under the old layout. They didn’t. You cross Exhibition Road now when there aren’t vehicles approaching – that is precisely how I could have crossed it before. Likewise I was the only pedestrian ‘wandering’ – every other person I encountered was sticking to the ‘pavements’, now marked out by bollards. Note that I am not saying that the road hasn’t been improved. I think drivers are slightly – slightly – more inclined to yield than they might have been previously. It also looks slightly better. The question is whether these improvements, on a short stretch of road, are worth £30 million; or, indeed, whether something better couldn’t have been achieved for a fraction of that cost. I’m in the process of writing another post – keep your eyes peeled. And Cromwell Road still has guardrail — indeed, new guardrail — on the pedestrian crossing at Exhibition Road. The old guardrail did stretch quite a way up Ex Rd… it was handy bicycle parking for the Sci Mus Lates. Ah yes, there was another segment of it by the Science Museum/tube station. But the vast majority of the street was without guardrail. Actually, I think the judgement should be exactly based on whether it’s better/worse than getting rid of the cars. The alternative to putting in shared space at Exhibition Road was not really the status quo. Everybody agreed that things had to change in such an important place. Doing nothing was hardly an option. This street got a mention in Richard Rogers’s 1995 Reith Lectures, for example, in which he described the then leading idea of banning the cars from it (alongside ideas that were later implemented, such as pedestrianising the north side of Trafalgar Square, and building a pedestrian river crossing between Traf and Waterloo). The “shared space” Exhibition Road should therefore be compared to the other bids for change which lost out to it, not just the status quo, especially given that one of the arguments for shared space over pedestrianisation was that people feel safer (as in social safety) with cars around.